Combining a passion for and a profound understanding of the tango with unparalleled skills as teachers, a maturity as dancers, and a full time dedication to technical excellence regardless of styles. Paz and Hart are the authors of the best seller book GOTTA TANGO, an important resource that offers a logical and structured approach to the craft of tango improvisation. I am happy to share with you what I have realized as the honor and gift of having Alberto Paz & Valorie Hart visit your community. It is really thrilling that you have the opportunity to host them in your city—because I know how much you and your community stand to gain from the experience! Alberto & Valorie are unlike any other tango teachers I have encountered anywhere because they combine their passion for and profound understanding of the tango with their unparalleled skill as teachers and their incredibly generous natures. I heard someone say once that they “never had to relearn anything that Alberto & Valorie taught” them. It couldn’t be more true. The hodge-podge of “steps” and “patterns” and confusing techniques of so many other teachers left me with no real understanding, no real progress, no educated passion for the tango before Alberto & Valorie came to Tallahasee, FL a couple of years ago. They have developed a method of understanding and learning the dance that is natural, thorough, and effective. I go out of my way to attend their workshops and private lessons—even in other communities—any chance that I can because with them I am truly in the hands of masters. Oh, it’s hard work, to be sure. But it is complete and inspiring and worth everything I put into it. I am in Jacksonville, FL now and our community here has recently hosted Alberto & Valorie for the first time! The Jacksonville community is just getting going and there is a new, eager energy here that benefits from the attention of the masters. Alberto & Valorie do much to raise the level of dancing in the community—making individual dancers feel delighted by their progress and giving them the tools and confidence to step out onto the floor. Starting the weekend after their visit, the community here began holding a regular, weekly milonga, organized by our local leader (who is also the one who hosted them here)! Through Alberto & Valorie we learn about the culture of the tango, the music of the tango, and have access to support in community-building efforts (including suggestions/methods to organize events and information) as well as access to the larger, national, and even international argentine tango community. And of course, they offer community leaders with training in the dance itself—so that the nurturing that they bring with them can continue when they are gone. Alberto & Valorie have so much experience in creating and growing healthy communities of tango dancers all over the country. The argentine tango has entranced me, which I’m sure you can understand. And with a deep love, humble respect, and complete confidence I can recommend that you whole-heartedly embrace the opportunity Alberto Paz & Valorie Hart present you! We are very fortunate to have them here in the U.S. --and in our lifetime!! I feel like my words can only say so much.... cheers. I’m a member of the tango community in Tidewater, VA where Alberto Paz and Valorie Hart just finished a week of classes and related events. We’ve been lucky enough to have studied with them twice, the first time being last spring in a nearby city. If you are a new organizer and are curious about what Alberto and Valorie have to offer, I hope you’ll visit this website and would like to hear from dancers who have experienced their teaching. First of all, as dancers, not only are they technically excellent, they also express the emotions of tango. They have developed teaching techniques that make their instruction clear, direct, and understandable to students. Further, they are scholars of the music, the history, and the culture of tango. And they are interesting, intelligent, amusing people. Because they have been at this a while and genuinely want to work with each community, they are people with whom you can discuss goals, expectations, and the best ways to promote a good outcome for all. I know that what I’ve said is very general, but I hope you get the idea that we are very happy to have had a second encounter with Alberto and Valorie and that we look forward to future workshops, classes, and private classes with them. If you have specific questions please email me. Best wishes with your tango group. I met Alberto and Valorie during the Winter of 1998, in California . I had just made the decision to learn Argentine Tango, after going to the show “Forever Tango” twice in San Francisco and watching the movie “The Tango Lesson” by Sally Potter. I needed someone from the Culture of Argentina to teach me Tango, as I had intuitively sensed how deep Tango seemed to touch the different delicate layers of the human emotions. Someone had given me their phone number. I called and during the preliminary introduction, I explained the reason of my call: “I needed someone to teach me Tango, but more than the steps. I wanted to understand the “Culture” behind the moves”. After his delighting usual chuckle, he said: “Well…you found me. I think I can teach you what you’re looking for”. These words marked the opening of a marvelous door to my quest. The first lesson consisted in Walking and… Walking, with no reference to any figure. I had to learn how to keep my partner in front of me, therefore, learn how to “negotiate” curving and straight paths. “Tango is a walking dance” Alberto said. Little did I understand at the time all the profound implications of that comment. Confident I was, sensing I was studying with someone who knew what he was doing. After several months of private and semi-private lessons, Alberto and Valorie encouraged me to start going to the milongas to dance. The dance floor is the place where my many lessons taken, would show, they kept saying. About 6 months later, as I signed up for the Nora’s Tango week-end (a major Tango event in the San Francisco Bay Area in July) I began to realize how fortunate I had been to study with Alberto and Valorie. I had been very well prepared to understand the instructions of other great Tango Masters such as Fabian Salas, Carlos Gavito, Tito…etc. that I encountered at the event and later on, studied with. I had NEVER had to go back and unlearn or correct anything Alberto and Valorie have taught me. For that I will be forever grateful to them. In the world where many delve and stagnate in so much fantasies and half information dispensed by people who have not yet studied long enough and yet want to be “teachers”, it means a lot to find the right Master Teachers such as Alberto and Valorie, from the very first neophyte’s steps. To teach is also to express love. It is a gift and a talent. I was very impressed with Alberto’s ability to go into my mind and explain to me a difficulty I was experiencing. He was thus able to help me identify the problem and therefore put me in a better position to correct it. Infinitely patient, Alberto and Valorie NEVER looked at their watch to “check the time” of the lesson. I remember one day where I was so enthusiastic about a subject we were studying, that I kept working on it and asking questions, over and over. At some point, Valorie went to the kitchen for a quick brake. I continued with Alberto for a while. Then, Alberto walked toward the couch, slumped onto it with his hands resting on his head. At that moment, Valorie came out of the kitchen and Alberto, looking at her said with a very calmed and exhausted voice : “I think we’ve created a monster!”. She burst out laughing. I quickly realized…checked my watch and (Oh my God!) we had been working for over two hours already, for a lesson that was meant to last one hour. I too laughed, apologized for my “stubborn focus” and departed shortly after to allow my teachers some rest. That availability of a Teacher, that Love expressed tirelessly for the student, has marked me forever. There is an indescribable joy in helping a student receive the information and to see that information take shape in his/her mind. The length of time it takes to accomplish the goal does not matter anymore. That is the modus operandi of Alberto and Valorie. Very attached to the historical accuracies, Alberto opened my eyes to many facts about Argentine Tango. He is the one who made me realize the contribution that the African descents in Buenos Aires , along with the Italian, Spanish and Indian, had brought to the birth of Tango. After the class, it was customary to sip a cup of tea, graciously offered by Valorie, in the kitchen of their wonderful house (I called it ‘The Temple of Tango”, because everything in that house was breathing Tango). During that special time, casual comments often helped me open my heart more to the Argentinean spirit. Alberto and Valorie gave me a gift of a priceless value, an added life lasting joy to my existence: the experience of Tango. They opened a window on the garden of my soul to let more rays of the sun and more warmth of Love rush in. Thank you! A personal invitation, powered by a strong conviction. I invite you to sample the best tango education that is available in this country. Everyone is used to reading superlatives these days, but I want to tell you that this is unlike any tango festival or workshop elsewhere. Traveling teachers will come and go, but there is no substitute for Alberto Paz and Valorie Hart, Tango EDUCATORS, at the pinnacle of their profession, a profession that is very different from tango teaching of top tango dancers. Alberto and Valorie will help you understand the whole world of tango, which of course includes, most importantly, tango dancing. They will give you a fresh perspective that is sure to bring you another dimension to enjoying tango and tango dancing, in a way that nobody else has done for me, and for countless other fortunate tango dancers all over the world. In the world of great tango dancers who teach tango, and great tango teachers who teach tango, Alberto Paz and Valorie Hart are in a class altogether separate. To get a taste of what’s in store for you take a look at Alberto and Valorie’s website, which is neither fancy, nor peppered with their own pictures, and to start with, find your way to the link entitled “Tango our Dance.” If there was ever a documented goldmine of tango, this is got to be it. I have had the opportunity to take group and private classes across the country with upwards of 60 tango dancers and teachers from the US, Europe, and South America, some of whom were truly excellent teachers, and it may come as surprise to some readers, that not all of the excellent teachers were Argentinos. I have also counted 13 teachers who I consider The Masters with whom I have had the privilege to study tango in private lessons, and I have had the good fortune of learning an immense amount, of tango, and about tango, from each and every one of them. 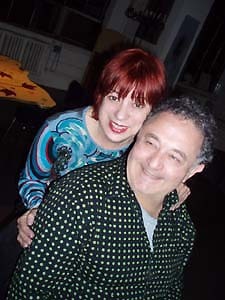 What I can say about Alberto Paz and Valorie Hart EXCLUSIVELY is, in a nutshell, this: every tango dancer, man or woman, at any level, owes it to himself or herself to study tango with Alberto and Valorie at least once, the earlier in one’s tango life, the better. No exceptions, no qualifiers to that statement. I was fortunate to find Alberto and Valorie early in my tango career, and I wish every tango dancer could have the same good fortune as I had. Tango would be all the better for it, for all of us. I sincerely hope you will make the best of this opportunity. We reside in post Katrina New Orleans. We have performed, given master classes, lectures and workshops in cities across America, from Anchorage to Miami, from San Francisco to New York, and hundred of cities in between, as well as in Italy, Portugal , the UK, the Netherlands, Germany and the Philippines. We have been instrumental in developing new communities, training qualified local teachers and encouraging efforts to preserve, foster and educate people on the core social and cultural values of the Argentine Tango music, poetry and dance. We take pride in being masters of improvisation and we encourage dancers of all levels and all ages to explore the possibilities of dancing with freedom on the spur of the moment, with confidence and an educated understanding of the music and structure of the dance. We have also created, choreographed and produced the musical revue “LIVE FROM THE TANGO BELT” premiered at the New Orleans TangoFest in 2003. We also choreographed and produced “RED HOT TANGO”, a dance revue based on the social dance history of tango featured at the 2005 New Orleans TangoFest. In addition, we published EL FIRULETE, the Argentine Tango magazine from 1994 to 2002, and are the authors of GOTTA TANGO, a reference book and DVD on tango dancing. Since 1997 we have applied, quantified, and applied a wealth of knowledge we were given by the Pugliese family and other extraordinary teachers from the golden years. We have develop a widely recognized clear and fair methodology for teaching the core concepts of the structure of the dance. VALORIE’s classical training and musicality prompts comments on her fluid and expressive dancing and her pristine and pretty footwork. We teach and dance the traditional and authentic concept of improvisation developed in the late 1930's and practiced by dancers in the social settings of the Buenos Aires dance halls to this date. ALBERTO PAZ was born in Argentina and grew up in the streets of Buenos Aires, the son of a blue collar family from the Northern province of Tucuman from where they migrated to Buenos Aires in the early 1940's seeking a better life. ALBERTO graduated from the School of Electrical Engineering of the University of Buenos Aires in 1967 and in 1968 he moved to California. After four years working as a Video Systems Engineer in Los Angeles PAZ moved to the Silicon Valley in 1972 seeking a future in electrical engineering. For the next 20 years he worked for small high-tech video companies, finally founding his own in the 1980s. But by the end of that decade, PAZ felt there was something missing in his life. ALBERTO began working at radio station KIQI in San Francisco as a soccer announcer and color commentator in 1988. In 1990 he produced a nighttime program doubling up as DJ playing South American music. Every now and then he would spin a tango from the station's collection and the phone lines would light up. The music brought back memories of home from listeners who grew up all over South America, and they wanted to hear more. Soon he switched to an all-tango format. To gear up for the show, he took a two-week trip to Buenos Aires, snatching up books and music, absorbing the history and culture of the music. He learned a lot of things that were already somewhere in his mind. For the 25 years he lived in Argentina, he had totally ignored the tango he heard every day at home. He grew up with rock & roll and cumbias. What PAZ uncovered was a rich history of music, dance and culture that was largely undocumented. At that time there were no English-language histories of tango. Since then PAZ tracks down the dance's roots with a disciple's fervor, having written a number of essays under the "Pacho to Piazzolla" title. Inspired by a second trip to Buenos Aires, PAZ returned to Sunnyvale ready to play more tango music. Soon he was DJing milongas and classes, but he never danced himself. He had grown up with the prejudice that tango was something one learned at a younger age. In Buenos Aires if men weren't good by age 18, they might as well forget it. Men who didn't know how to dance the tango, found out that no woman would dance with them. Even though ALBERTO grew up in Argentina surrounded by the culture of the tango, he felt awkward when he took his first steps in 1991. For the first six months he found the dance a trial. After a while, PAZ learned a few steps, but never really applied himself. Then, at a milonga in San Francisco one night, he realized that he was the only Argentine in the room and the only one not dancing. That night PAZ made a commitment to learn tango. Like so many other Argentinians, he was rediscovering what his parents already knew. Within six months he began to think there was hope. That was in 1993. One year later the musical show Forever Tango came to San Francisco for a four-week engagement, and ended up having an impressive ninety two week run. ALBERTO became involved in all aspects of promotion, assistance and personal attention to all members of the cast, who considered him the "Godfather of the tango." Then in 1995, on a whim, ALBERTO attended the Stanford Tango Week and saw HART leaning against a dance studio door. While PAZ was discovering tango, HART was living a successful life in New York City, running her own business, oblivious to the dance that would change her life. One night while she was making a pasta dinner with a group of Argentine friends she met through her corporate event planning business, someone put on a tango album. An Argentine friend boasted that he would teach her tango. But it only took a few steps for them to realize that no one in the room could dance it. As with PAZ, the dance had passed these Argentines by. They promised to take lessons, and HART's interest was sparked. When she heard about Stanford's tango event, a two-week-long, eight-hour-a-day tango celebration featuring some of the world's best dancers, she had to check it out. She showed up in Palo Alto just curious, not looking to change her life, meet anyone or fall in love. But then she danced with PAZ. Not till she met ALBERTO did she feel comfortable dancing. He produced a safe haven for her to dance. They danced and talked and got to know each other. At the end of the week they parted, keeping in touch via phone and fax. Tango touches people at crossroads in their lives. There is something deep about the experience of connecting with someone. HART's mother had just died, young and suddenly, during the time VALORIE was introduced to Argentine tango. That made her realize that life is short. She was approaching her birthday and suddenly she thought, where did the years go? Three months later, ALBERTO visited her in New York and asked her to come to Sunnyvale. She packed her bags and left New York behind. VALORIE's childhood was spent teaching at her mother's school, dancing in various productions and preparing for a professional career. However, HART was more interested in becoming a painter and a writer. At age 16 she was presented with choices about how to continue her higher education. She chose art school, starting with the Art Institute of Chicago and continuing in New York City at Pratt Institute, School of Visual Arts, Art Student's League, NYU Film School, Parsons School of Design. All along her educational period, VALORIE continued dancing off-Broadway and in summer stock. She also acquired some performance experience holding movie extra roles, bit parts. etc. Her artisitc career took a dramatic turn when she became a pivotal member of a rock band, sharing lead vocals performances as well as co-writing many of the band's songs. VALORIE also studied poetry at The New School and the 92nd Street Y with Erica Jong Michael Bennet, Edward Field and Michael Halpern. VALORIE had a successful fifteen career as an internationally recognized event designer in New York before being drawn to the tango. As an artist she possesses a natural sensitivity for the Argentine Tango, the music, the dance and its culture. Graciela Gonzalez was her first mentor. Esther Pugliese and Guillermina Quiroga contributed greatly to her formation in the authentic Argentine style of dancing, and she developed a unique quality for dancing and teaching in a journey which began in 1995 alongside ALBERTO. They dropped everything to be with each other, and not long afterward they started a company, Planet Tango. The long run of Forever Tango in the San Francisco Bay Area gave them the opportunity to change the format of their local publication, EL FIRULETE, into a tango magazine of international circulation. They brokered lessons for members of the cast and for visiting teachers, arranged guided tours to Buenos Aires, and sold CDs, shoes and anything else related to tango. They also danced up and down the California coastline, and in 1996 they were asked to teach their already smooth and authentic style of dancing in Los Angeles once a week for six months. Thus begun the most important chapter of their tango lives, one that would eventually lead them to the source itself, the city of Buenos Aires, and to the Salvador Sciana academy run by Esther and Mingo Pugliese. This was 1997, and ALBERTO and VALORIE become one of a handful of disciples of the grand masters. Before their life altering trip to Buenos Aires, the teaching of tango had been based on an oral and visual discipline consisting in a "let-me-show-you and-then-you-try-it" approach. The dancers who had a direct connection to the 1940's golden years didn't like to reveal their secrets. Teaching began wit stage dancers as a way to supplement their income, and following a prescribed set of basic choreography. As dancers eventually traveled to Buenos Aires they find out that they couldn't dance on the crowded dance floors of the city.